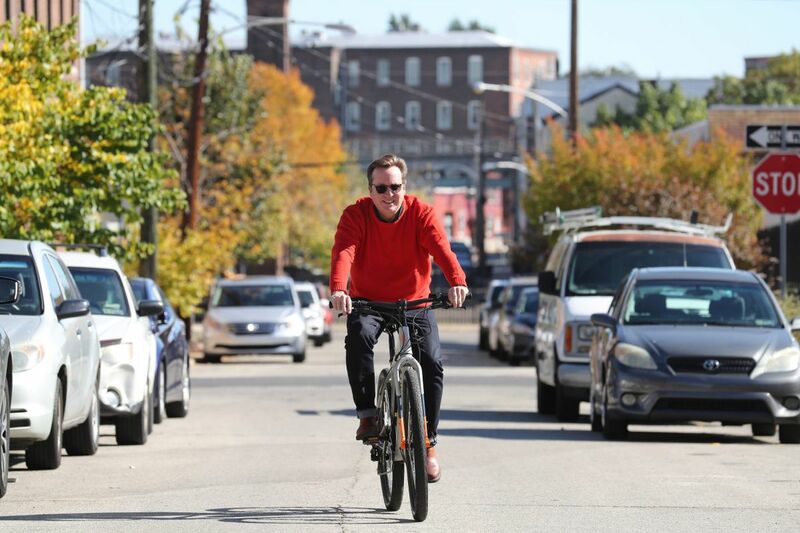 As the "old" guy at Junto Bicycle Works Ltd., an electric-bike manufacturing start-up on the edge of Philadelphia's millennial-heavy Fishtown neighborhood, 55-year-old Brian Powell is dazzling his younger collaborators with his legs. Not his actual gams, impressive as they may be from Powell's pedaling (with battery-powered assistance) more than 25 miles a day between his Chestnut Hill home and Junto's headquarters. It's his "sea legs" — his calm during daunting times, which are numerous with a young enterprise. "When things get rocky or things get uncertain, he's got a very stable pair of sea legs on him," said Sam Ebert, 25, product director at the year-old company, which shipped its first bikes to consumers Nov. 1. "It's really comforting to me and other guys in the company to hold so steady." That calm demeanor has been honed by 35 years in business, starting when Kenneth and Mary Powell's youngest of seven children left St. Joseph's University without a degree but with irrepressible entrepreneurial nerve. Brian Powell, who grew up the son of a cop in South and Northeast Philadelphia, went on to sell icy treats (FrozFruit), chicken (Farmers Pride and its successor Bell & Evans), artificial sweetener (NutraSweet), and energy bars (Balance Bar and allGoode Organics) with varying success before starting Powell & Mahoney, an especially toast-worthy venture, in 2010. That Salem, Mass.-based company produces all-natural cocktail mixers, with annual sales close to $15 million, Powell said. Starting an e-bike business in an industry still gaining traction in the United States — estimates indicate only 200,000 will be sold this year — doesn't scare Powell, who attributed that cool, in part, to age. "What happens in your dotage is, you become content with who you are," said Powell, married with two kids in college. "You become wise. I know what I'm good at. I know what I'm not good at. I'm pretty good at starting brands. Why stop?" This business idea started in August 2016, when Powell was vacationing in Cape May and headed out on a traditional road bike toward Ocean City. There he was on Route 9, hunched over and pumping the pedals hard, when inspiration came whizzing by. "I was past Wildwood, and a big guy flies by me on a bike," said Powell, who whistled him to a stop for an inquisition. "I said, 'What the eff is this, buddy?' He said, 'My brother and I made this in our garage.' "
Powell talked the guy into letting him take a spin. "It was like I had a jet pack on," he said. "It was like Buck Rogers, like Star Trek. Superman came down from Krypton, and he saw a bike, and he got on it. That's what it's like." A self-described obsessive with "incredible vision," Powell went home and couldn't get that contraption off his mind. "I commenced to research, and I dug in, and I really, really fell in love with the whole idea," he said. Research showed electric bikes were tremendously popular in Europe and Asia, yet a relative blip here. What was selling in the U.S., Powell added, "was really cheap, horrible … incredibly unsafe." What happened next Powell described as a yellow-brick-road journey. But instead of meeting up with the Scarecrow, the Lion and the Tin Man, he met Ebert and Mike Tonkinson, and reconnected with an entrepreneur he had done business with in the past, Simon Goode. The baby boomers and millennials of Junto Bicycle Works Ltd. (from left), Brian Powell, Sam Ebert, Mike Tonkinson, and Simon Goode, also 55. Ebert's mother is Powell's neighbor. When he mentioned his ambition to build an electric bike, Kristen Kreider told Powell he should talk to her son Sam, a Germantown Friends School alum who had been working on bikes since he was a young boy and, while at college in Ohio studying studio art, started the Kenyon College Bike Co-Op. To that professional mountain biker, Powell emphasized his intention of not "competing with bikes; I want to get cars off the road. I would like to eliminate congestion. I want to give people another option to get around our great city." Ebert was hooked and got Powell to enlist Tonkinson, 27, a University of the Arts graduate and watch designer, as creative director to help with web and product design. Ed Benjamin, a consultant in the bike industry, gave Powell encouragement, telling him there was opportunity in the market for a "modestly priced, super-high-quality e-bike for America," as Powell recalled it. Powell, Ebert, and Tonkinson designed a commuter bike with the goal of standing up to what Powell suggested "could be the worst conditions in the First World for riding a bicycle — cobblestones, trolley tracks, potholes and people's half-eaten Whoppers. I say that because I slipped on one." Designing, test-riding, and tinkering took four or five months. They went to China for parts. For funds, Powell reached out to a half-dozen friends from his days at La Salle College High School and St. Joe's, who kicked in $600,000. Explaining the ease of convincing his friends that an e-bike company was a worthy investment, Powell said: "For people like us, guys getting old, it's bikes, man. Let's change the world. These guys are ecologically minded." In June, Goode — who cofounded allGoode Organics in Santa Barbara, Calif., with Powell in 2000 (they sold the company three years later) — called Powell. A numbers guy and graduate of the London School of Economics, Goode said he had moved to Boise, Idaho, and was looking for his "next great adventure." A minute and a half into Powell's description of his e-bike venture, Goode, also 55, said he was in. As Junto Bicycle Works' chief operating officer and chief financial officer, he has been making monthly trips to Philadelphia since then to help the company prepare for product roll-out. Twenty bikes, selling for $2,222 each, were sold within 10 days of the website going live. Featuring 29-inch wheels, a seven-year warranty on the bike, and a two-year warranty on the battery and motor, Juntos were exhibited Saturday and Sunday in Philadelphia at the 2017 Electric Bike Expo. The bikes offer five levels of pedaling assistance, up to 20 mph. Anything faster is the result of rider power and/or a steep downhill. Depending on rider weight, road conditions, and selected mode of assistance, the battery can support rides as long as 30 to 60 miles before needing to be recharged, Ebert said. Mike Tonkinson, creative director at Junto, takes his model for a spin at the Electric Bike Expo at the Pennsylvania Convention Center on Nov. 5. For a company name, Powell, Junto's president and CEO, tapped his love of history. He considered Philadelphia's role in Benjamin Franklin's discovery of electricity, and a philosophical group the inventor cofounded to meet for discussions of weighty issues — the Junto Club. Junto bikes are assembled in Boise and shipped to customers in custom-designed boxes. On delivery, the front wheel and right pedal must be attached with accompanying tools. Competitors sell through bike shops, a middleman approach Junto wanted to avoid to keep costs down, Powell said, adding: "I do not want to put a mom-and-pop shop out of business. I want to make sure that the independent bike shops realize they are going to be able to fix our bikes." It's a business model that one of his millennial colleagues, Ebert, the bike-repair expert, has reluctantly come to accept. Sort of. "I'd be lying if I didn't say I still have kind of deep, dark reservations on occasion about the direct-to-consumer industry," Ebert said. "At the same time … it is the way things are going to be proceeding." After all, it's what millennials demand.